Rich dark chocolate and ripe bananas. These Granola Minis taste just like dessert and contain the nutrients found in one full serving of vegetables. The perfect snack, for big and small persons. Granola Minis are made in a dedicated facility free from the 8 common allergens: peanut, tree nuts, wheat, dairy, egg, soy, sesame, fish and selfish. 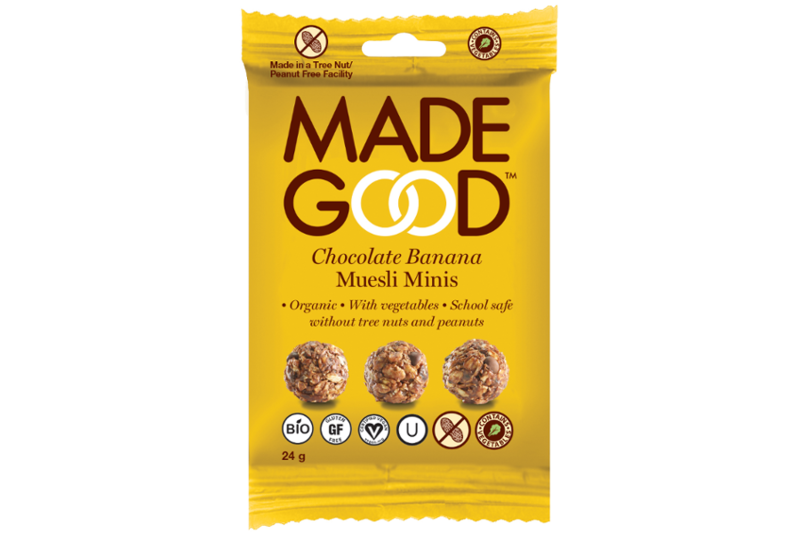 Pure rolled oats* (40%), bananas* (8.5%), cane sugar*, chocolate chips* (cane sugar*, cocoa mass*, cocoa butter* vanilla*) (8.5%), sunflower oil*, agave nectar*, whole grain crisp brown rice*, agave inulin*, tapioca flour*, vegetable powder (spinach, broccoli, carrot, tomatoe, beet) (0.4%), shiitake mushroom powder, banana flavour*.